After a late night hearing at the Supreme Court, BJP's legislative party leader BS Yeddyurappa was sworn-in as the Chief Minister of Karnataka. After a late night Supreme Court hearing that continued until 5:28 am this morning, BJP's legislative party leader BS Yeddyurappa was sworn-in as the Chief Minister of Karnataka. The swearing-in took place after the apex court refused to stay BJP's CM candidate's oath taking ceremony. The SC was hearing a plea filed by the Congress and the JD(S). Speaking to media after Yeddyurappa's swearing-in, a dejected Siddaramaiah mumbled, "I have lost faith in democracy." Congress leaders and MLAs are now staging a dharna (sit-in protest) outside the Vidhan Soudha (State Legislative Assembly). The Supreme Court, however, did not dismiss the petition. The SC bench will now hear the matter on Friday after it gets letters of approval in Yeddyurappa's favour. BJP has time until tomorrow to prove their majority. Earlier, the Karnataka Governor had given BJP a 15-day time to prove its majority on the floor of the house. After hearing the matter for more than three hours beginning 2.11 am, a three-judge bench, comprising justices A K Sikri, S A Bobde and Ashok Bhushan, directed that the letter sent by the BJP to the governor for forming the government be placed before it. The court made it clear that the swearing-in and the government formation would be subject to the final outcome of the case before it. Senior advocate Abhishek Manu Singhvi represented the Congress-JD(S) combine in challenging Karnataka Governor's decision. While the BJP was represented by former Attorney General Mukul Rohatgi who said, "The matter shouldn't be heard in the night. Heavens won't fall if someone is sworn in. Last time SC heard in night, the case related to hanging of Yakub Memon." 11:45 am: Meanwhile, senior lawyer Ram Jethmalani has moved an application in the Supreme Court for urgent hearing against the Karnataka Governor's decision to invite BSY to take oath as chief minister. The Supreme Court has now directed him to mention it on Friday before an appropriate bench. 11:25 am: The newly sworn-in Karnataka chief minister said, "I will waive off farm loans soon." 11:15 am: CM Yeddyurappa, addressing a press conferrence in Karnataka, said, "I want to thank all the people of the state." Yeddyurappa also hit out at the Congress and the JD(S), saying they were trying to "immorally" form alliance in Karnataka. 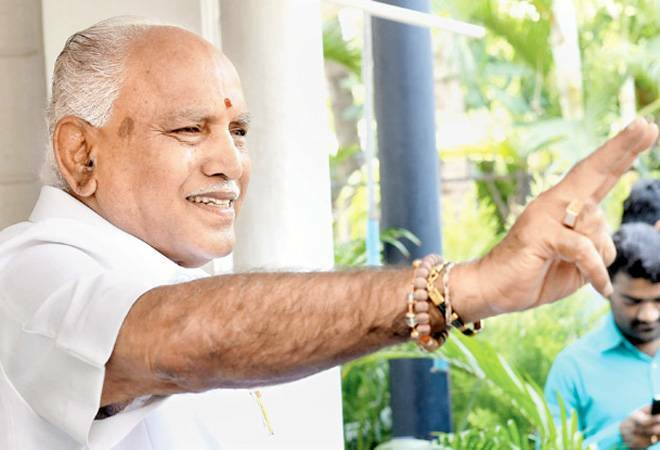 Yeddyurappa also suggested that some of the Congress and JD(S) MLAs would support him, saying, "[A] lot of Congress and JDS [MLAs] want a BJP government. They should vote during [the] trust motion [based on their] conscience." 10:00 am: One of the Independents, R Shankar was till Wednesday morning seen at BJP leader BS Yeddyurappa's residence in Dollars Colony, but later in the evening he pledged allegiance to the Congress-JD(S) combine. 09:45 am: Trouble mounts for Congress, JD(S) as two Congress MLAs are now being reported to have gone 'missing'. One of them is Karnataka Congress MLA Pratap Gowda Patil from Maski (Raichur) who also signed the document on Wednesday, pledging his support to HD Kumaraswamy. 09:20 am: BJP'S BS Yeddyurappa takes oath as Karnataka Chief Minister in the name of farmers as the crowd chants 'Modi Modi'. 09:00 am: Congress president Rahul Gandhi termed BJP forming government today as 'mockery of our Constitution'. The BJP's irrational insistence that it will form a Govt. in Karnataka, even though it clearly doesn't have the numbers, is to make a mockery of our Constitution.